The invention of the cell phone gave job seekers one of their most powerful tools. You might do your search and application process over computers and emails, but the cell phone is your primary weapon when it comes to the interviewing stage. Wielding this weapon in the right way can be very important to your overall job search success. I like the cell phone for the simple reason that it gives you immediacy. Immediate feedback and immediate response. You know right away when interview offers come in. 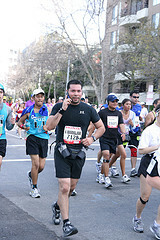 And you can follow up right away… even while you’re in the middle of running a marathon, according to the picture (not recommended). If you use your home phone, at best you have to call in to your voicemail. At worst you have to go home, get the message, and at that point it’s probably past business hours, so you can’t respond in a timely manner. You NEVER want to job search on your work cell. Personal cell only. One cell phone. One number. One number for them to call and reach you reliably, and one number that will show up on their caller id when you respond. No confusion that way. And all of your job-search related voicemails are in one place. My favorite thing about the cell phone: you can follow up right away, but you don’t have to take every call blindly. Some people might not agree with this, but I say, let the call go to voicemail. This way you can see who called and what their business is. Is your schedule open for the interview time they offered? What are they offering? Is it worth it? Going to voicemail gives you a quick chance to think things over. And then there’s this… WHO is that that called again? If you’re managing a big job search, you have time to do a quick google search or re-read the original job post you applied to. Bone up a bit before you call back so you know what you’re talking about. You probably don’t want to follow up to, or manage interview requests while at work. No prob. Step outside. Do it on your lunchbreak. They can make the offer and you can respond in the same hour. No trying to juggle or hide messages from your boss. And keeping your cell phone on your desk all day set on vibrate is a good and private way to see what offers are incoming. Having said that, try to call back from an indoor, or at least a quiet location. Just simple courtesy. I worked in an HR office with a recruiter who got really mad whenever someone she was talking to was on a cell phone. I thought she was being completely unreasonable. Obviously it’s poor form to conduct an interview or call a recruiter when you have bad service, but it’s a reality of job search that candidates rely on their cell phones for a number of reasons. I haven’t had a landline number in 6 years, and I’m sure there are a lot of people out there who are like me in that respect.